HootSuite is a social relationship platform for businesses and organizations to collaboratively execute campaigns across social networks such as Twitter, Facebook, LinkedIn and Google+ Pages. This is a three part article that overviews Kapost's integration with HootSuite, as well as explains and provides directions for implementing the three ways HootSuite helps you manage your content in Kapost. Before you begin, you need to be a customer of both HootSuite and Kapost for this integration to work. 1) Is there an advantage of sending your social media posts directly from Kapost versus going through Hootsuite? Analytics will be available in Kapost. Allows users to see what messages are driving the most traffic to content and allows users to analyze what is and what's not work from a social perspective. Provides visibility into ALL of your content efforts around an initiative or piece of content in one place (Kapost)...shows up in the initiative and content catalogs as well as the calendar. 2) If we push content to Hootsuite from Kapost, do we lose tracking visibility? Yes. The way that Kapost queries Social sites like Facebook, LinkedIn, and Hootsuite for tracking is by asking for how many times the published/shared URL shows up on the social platform in question. Hootsuite changes URLs to their owl.ly format after Kapost pushes to Hootsuite, breaking this query. Currently Hootsuite does not pass back tracking information to Kapost. Analytics will not flow back from Hootsuite into Kapost. Part 1: Submitting ideas into Kapost through HootSuite. First, install the Kapost App in HootSuite. Once the app is installed, you will be able to send posts from any of your streams directly into Kapost as an idea. Simply choose a post and click in the black arrow in the top right corner. When the drop-down menu appears, click "send to Kapost." A window will appear. Choose the Instance you'd like to submit to by choosing from the "Submit to Newsroom" drop-down menu. Fill out the idea title and add any additional comments. Log into your Kapost instance. 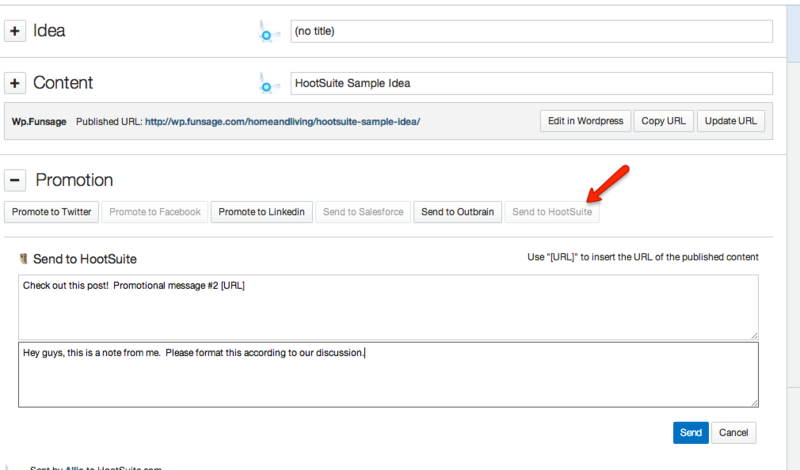 Your HootSuite post will be there in Idea form, with the owner of the HootSuite account set as the author. It will default to a random content type. Go into that post and change the author and content type to what you'd like it to be, create the rest of the post if necessary and submit! 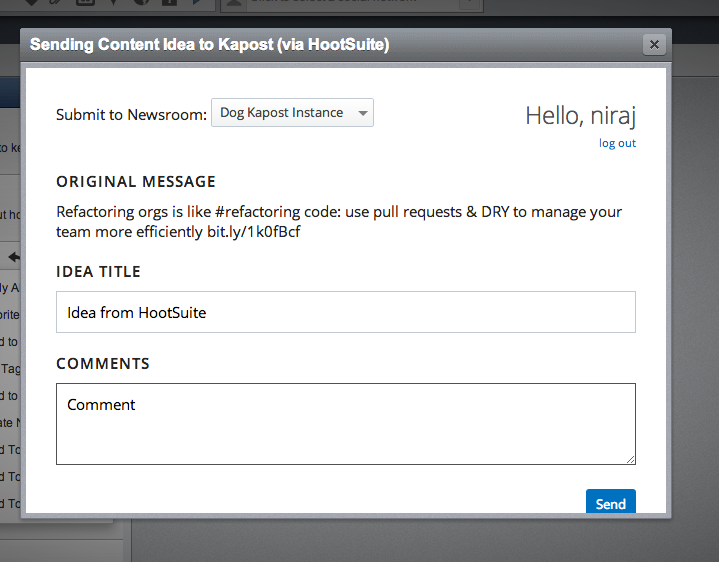 First, make sure you have integrated with HootSuite through Kapost. To learn how to do this, read the second part of this article. Once you have integrated with HootSuite and have added it as a Promotion Destination on one or more content types, you can send posts of that content types to HootSuite. First, go to a published post and scroll down to "Promotions." You will see a button labeled "Send to Hootsuite." Please note, this button only appears after a post has been published. When you click it, two text boxes will appear - one with a draft of the promotional message you'd like to use, and another with any notes or comments you'd like your team to see. Click "Send." If you go into your HootSuite account, you will see this post in your Kapost Promotions Stream. 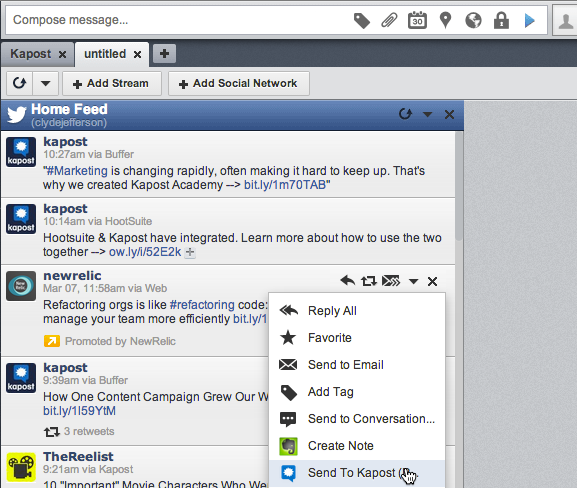 Downloading the Kapost app in Hootsuite will give you access to two streams - your Promotions and your Content Catalog. The Content Catalog stream contains ALL of the content created in your Kapost instance. This is very useful but can be kind of overwhelming, so the third way you can manage your Kapost content in HootSuite is by using the filters. These filters are calibrated to your Kapost instance, so you can filter by the Personas, Buying Stages, Categories, as well as other filters you use on your content feed. 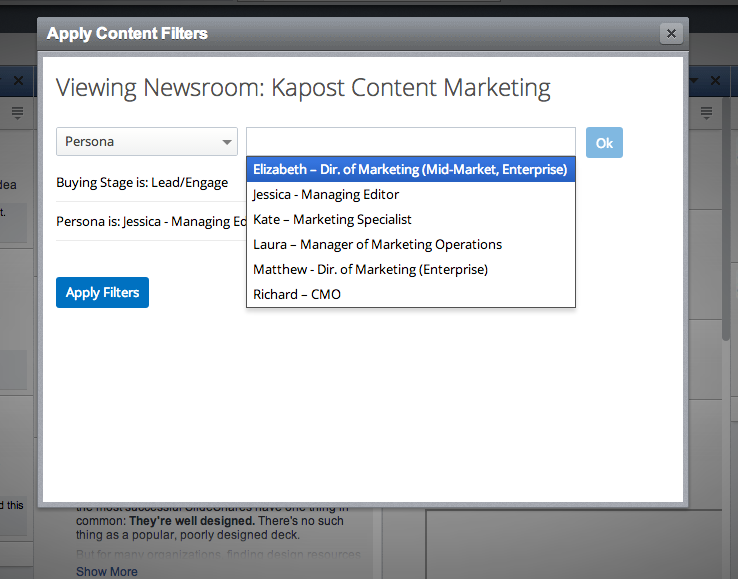 To do this, click on the funnel icon on the Kapost Content Catalog stream. This will open up a window that allows you to choose how to filter your content. You can use the drop-down menu on the left to choose the kind of filter you want to use, and use the box on the right to specify the category within that filter. This will help you narrow down the content in your feed so that you can find exactly the sort of content you are looking for. If you have any questions about the Kapost/HootSuite integration, feel free to email us at support@kapost.com and we will be glad to help you.